Desktop Blogging Tools: Are You Using the Right Blog Tools? Browse: Home › Blogging › Desktop Blogging Tools: Are You Using the Right Blog Tools? Blogging with the right blog tools can enhance and speed up your blogging. It can help you focus on writing rather than spending a lot of time on formatting, image editing and other stuff. Many of you might be using online blog editors to write your posts. However, this can be a time consuming approach as you need to spend more time formatting and styling instead of concentrating on writing good content. Every time you save your work, the data is sent to the server which halts your work momentarily. Inserting images, drag-n-drop can be tricky. Formatting gets painful at times and you get limited options when using a web-based editor. Using desktop blogging tools will ease up your blogging efforts and help you concentrate on writing rather than formatting, thus enhancing your productivity. Professional Bloggers always prefer using desktop blogging tools. These blog tools can be beneficial in a number of ways. They can radically speed up your blogging process. There are many value added features to simplify your work. You can even write your posts sitting comfortably in your garden and publish them later. No need to run around for the internet connection when you can develop your posts offline. 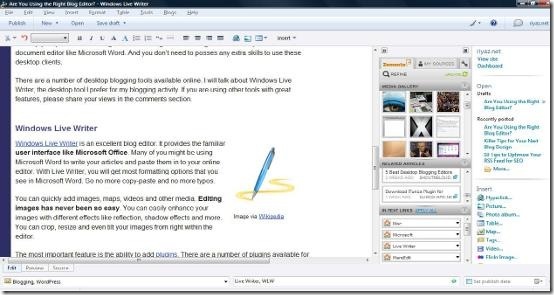 You get the best text editing and formatting features as in your favorite document editor like Microsoft Word. And you don’t need to posses any extra skills to use these desktop clients. There are a number of desktop blogging tools available online. I will talk about Windows Live Writer, the desktop tool I prefer for my blogging activity. If you are using other tools with great features, please share your views in the comments section. Windows Live Writer is one of the excellent blog tools. It provides the familiar user interface like Microsoft Office. Many of you might be using Microsoft Word to write your articles and later paste them in to your online editor only to find that all formatting has messed up. 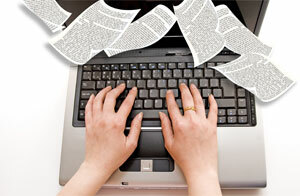 With Live Writer, you will get most formatting options that you see in Microsoft Word. So no more copy-paste and no more typos and rework. It lets you quickly add images, maps, videos and other media to your posts. Editing images has never been so easy. You can easily enhance your images with different effects like reflection, shadow effects and more. You can crop, resize and even tilt your images from right within the editor. The most important feature is the ability to add plugins. There are a number of plugins available for you to install. These will further add up to the functionality. Plugins like Zementa or Flickr4Writer can help to get image and link ideas for the post as you write it. You can easily insert royalty-free images from Flickr. Here’s a good post on how to set up Windows Live Writer blog tools for your WordPress blog. If you are on Mac, you can consider popular tools like Ecto, MarsEdit, Qumana, and Thingamablog. Thingamablog works for Linux as well. Windows Live Writer and Ecto both allow you to install plugins to add more features and functionality. A desktop blog editor is a must-have in a blogger’s toolbox as it helps you quickly enhance the look and feel of your blog posts while you can still concentrate more on the content. Get one for yourself and blog with ease and efficiency! What blog tools do you use for your blogging? If you are using any of the desktop blogging tools, which one do you like the most and what plugins make your life easy? A set of very helpful posts for me, an OLD coot trying to edge in to social media. It’s an uphill climb. Have a site platform for the book I am writing, THE book of my passion. I’ve decided to put the activity to build that “tribe” you youngin’s talk about on the blog, refering to the booksite for serious parties. This blog is cool, yet soft with touches of warm whimsy. BUT it’s on Blogger. In light of your helpfuls above: 1) can I keep the design and feel and move over to WordPress? or, 2) can I apply just a couple of simple plugins and widgets to Blogger. Seems it’s old and not so popular. I am glad that you found this post useful. You can migrate from blogger to WordPress (self hosted on wordpress.org) easily. WordPress has an in-bulit option that allows you to import posts, comments and users from a Blogger blog. After installing WordPress, simply go to Tools –> Import and choose Blogger. If you want to keep the design and feel similar, you need to search for and find out similar looking WordPress themes. I am sure you can easily find one. WordPress themes are easily customizable so a theme to your likings can be built if not available. About your second question on plugins for blogger: there are many plugins now available for Blogger as well. Try it out. However, using WordPress will give you more options to play around and customize your blog the way you want.